For she did not approach the sword as flesh and blood. Sebastiane (Sebastiana, Sevestiane, Sebastiani) lived and struggled in Marcianopolis (modern-day Devnya, Bulgaria), during the reign of Emperor Domitian (81-96). Having been baptized by the Apostle Paul, in the year 81 she continued to proclaim the good news of Christ. Due to her missionary work as a Christian, she was slandered before Governor Sergius. Therefore, she was made to give an accounting before him. She boldly confessed that she believed in Christ and that she was taught and received baptism by the Apostle Paul. She also added that she was prepared to die for Christ. At first, they beat her body with lead balls, and then flung her into prison. In that dungeon, the Apostle Paul appeared to her, and said, "Rejoice and sorrow not, for you will go bound to your own homeland on behalf of the confession of Christ!" After seven days, the governor removed her from prison for further torture. He lit a furnace and commanded that she be cast within the flames. Sebastiane remained ample hours within the furnace. When she exited unscathed, all marveled and were amazed. After the Martyr uttered a prayer, she heard a dreadful noise from heaven, with thunder and lightning. Hailstone mightily fell and pelted the furnace, extinguishing the fire. By the shower of hail, many were in danger of dying. The governor, frightened, then departed with his retinue. Later the governor remarked to Sebastiane, "Who are you? What is your purpose? And from what land do you hail?" The Martyr fell silent. The governor then learned from the bystanders that she was from Heraclea, a city of Thrace. After he had her bound, he remanded her to the governor of that area. Then an Angel of the Lord appeared to her, saying, "Take courage, O daughter, though you will stand before the governor, I shall be with you." At length, the holy Sebastiane arrived in Heraclea and appeared before the governor. He sentenced her to be hoisted high upon wood that resembled the block of a pulley. 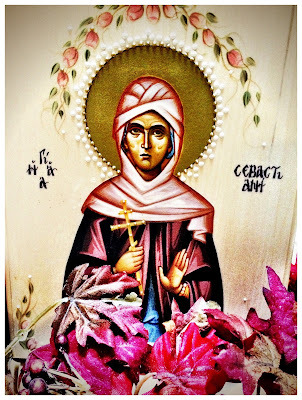 After they rent asunder her body for three hours, the torn flesh of the Saint yielded a fragrant myrrh. All the while, as Sebastiane remained silent and in prayer, all remarked than an animated soul and living body did not suffer, but one without senses. When they lowered her from the wheel and axle, they cast her as prey to wild animals. A great lion approached the holy woman which, by divine command took on a human voice. The wild beast then praised and blessed Christ's Martyr, but censured and condemned the impious and lawless. A lioness then drew near and stood to the other side of the Martyr. Thus, both lions stood to Sebastiane's right and left, as innocent lambs. The governor was sore amazed at this spectacle and was at a loss at how to proceed. Therefore, he sentenced the Martyr to die by decapitation outside of the city. Thus, Saint Sebastiane was beheaded and - O the wonder! - instead of blood flowing from the wound, milk gushed forth, just like her teacher Saint Paul. The profane governor then commanded that her honorable head be placed in a sack with three hundred pounds of lead and cast into the sea. This being done, an Angel of the Lord tore open the sack and bore the honorable head and relic to a place called Resistos (or Rhaidestos, city on the north shore of the Sea of Marmara). This was revealed to a senator's wife, named Ammia, who took up the august relics and wrapped them with linen and anointed them with myrrh. The relics were then interred in a special place at Resistos, to the glory of God. Having been illumined by the words of Paul, you customarily contested for the Savior Sebastiani, enduring a multitude of torments, by the power of your bridegroom Christ; therefore ceaselessly entreat on our behalf, who reverently cry out to you: Glory to Him Who gave you strength, glory to Him Who crowned you, glory to Him Who works all manner of healings through you. Having received the light of Christ, through Paul, and fervent faith, you contested on His behalf, glorious Sebastiane, taking no care for your flesh, and you found life without pain, when the sword cut you at the neck. Contesting as if fleshless in the flesh, and your decapitated head, wondrously gushed forth milk; Martyr of Christ, O Sebastiane, He glorified you for having brilliantly glorified Him in your contests.